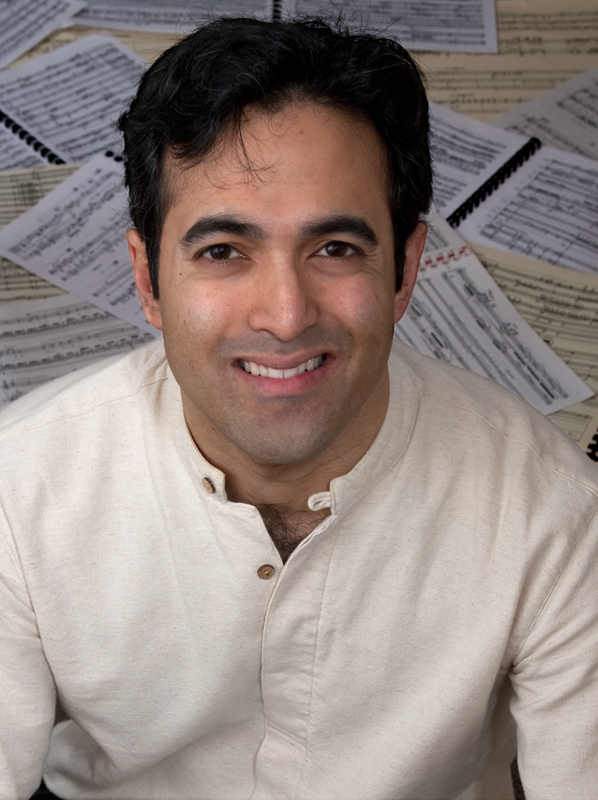 Vineet Shende’s music has been called “startlingly intense and vivid” (Boston Musical Intelligencer). It often deals with conceptual issues of timbral development, structural order, and the Japanese aesthetic concept of ma (“active” space and time). Shende’s music incorporates a wide variety of styles, including the modal and rhythmic world of North Indian classical music, the visceral energy of rock music, and a harmonic language described as “hard to characterize, dissonant in some places and with celestial harmonies in others, but unusually accessible” (Portland Press Herald). His music has been performed throughout the United States, Europe, and Asia, and has brought him recognition in the form of awards, fellowships, and grants from such organizations as ASCAP and the Mellon Foundation. Recent premieres have included Piano Concerto, commissioned by the Midcoast Symphony Orchestra for their 25th Anniversary, Naimittika Pralaya for double string orchestra and prepared piano, commissioned by the Boston Modern Orchestra Project, and Three Longfellow Poems for soprano soloist, two choirs and orchestra, commissioned by the Portland Symphony Orchestra. Ensembles such as the American Modern Ensemble, the Amernet String Quartet, the Cassatt String Quartet, the Aeolian Chamber Players, and the National Symphony Orchestra have all recently performed Shende’s music. Recent recordings (on the New Focus label) include the “vigorous and sassy” (Gramophone Magazine) Throw Down or Shut Up! on Flexible Music’s debut album FM, and the “particularly outstanding” (American Record Guide) Sonetos de amor performed by soprano Elizabeth Weigle and guitarist Daniel Lippel on Lippel’s album Sustenence. Shende’s formative years alternated between the cities of Chicago, Illinois and Pune, India. His earliest music lessons were from his mother, a vocalist trained in North Indian classical music. He holds degrees from Cornell University, Butler University, and Grinnell College. His principal composition teachers have been Steven Stucky, Roberto Sierra, Michael Schelle, and Jonathan Chenette. He has also studied music with sitar virtuoso Ustad Usman Khan and conducting with Stanley DeRusha and Scott Tucker. Shende is an Associate Professor and Chair of the Music Department at Bowdoin College in Brunswick, Maine, where he teaches courses in composition, electronic music, orchestration, music theory, music history, and Asian music.